Prostate tumours may spread by ‘spitting out’ a protein that ‘activates’ dormant cancerous cells, a study suggests. Scientists found tiny pieces of a protein, called EN2, are taken up by other cancerous cells, causing them to change shape or fuse together. Fused cancer cells are thought to be a sign of aggressive cancer that is better at spreading and surviving chemotherapy. Taking up EN2 also causes cells to express a gene that helps to hide tumours from the immune system, the ‘very significant’ research found. The University of Bradford researchers hope blocking EN2 will lead to more effective treatments for cancer. The study was conducted on prostate tumours. Existing drugs for prostate cancer can cause erectile dysfunction or urinary incontinence. 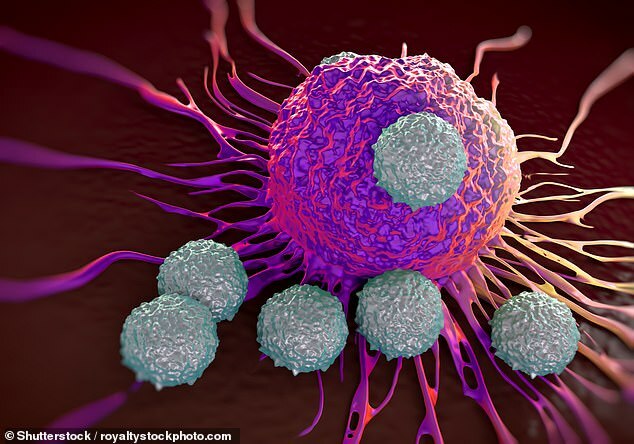 Professor Richard Morgan, study author, said: ‘For tumours to survive, grow bigger and spread they need to control the behaviour of cancer cells and the normal cells around them and we’ve found a means by which they do this. Around 50,000 men in the UK are diagnosed with prostate cancer each year, data from Cancer Research UK shows. And in the US, around 174,650 men are diagnosed every year, American Cancer Society statistics reveal. EN2 has previously been found to play a role in early brain development, as well as being present in high amounts in many types of cancers. To determine the part it plays in prostate cancer, the researchers tagged the protein with a fluorescent green marker in the laboratory. They then studied how it interacts with both cancerous and normal cells in a human prostate model. Results revealed both cell types fuse with vesicles carrying EN2 and then take the protein up. To examine how this occurs in finer detail, the researchers carried out time-lapse photography, where pictures were taken of the cells every five minutes for 24 hours. It showed the cells eject EN2, which is then taken up by dormant cancer cells, causing them to become activated, change shape or fuse together. The cells then generate another EN2-containing vesicle that they too can expel. ‘We think this is significant because cell fusion in cancer is relatively unusual and is associated with very aggressive disease,’ Professor Morgan said. Further analysis revealed that when normal cancer cells take up EN2, they express a gene called MX2. This generates an anti-viral response that may help tumours . ‘We believe the cancer is trying to minimise the chances of the cells around it being infected by a virus, to avoid scrutiny by the immune system,’ Professor Morgan said. The researchers were surprised to find EN2 was expressed in the cell membrane rather than just it’s nucleus, which acts like a brain. They believe this will give scientists greater opportunity to block EN2’s action by targeting a part of the protein expressed on the cell’s surface. Study author Hardev Pandha, professor of medical oncology at the University of Surrey, added: ‘This work follows on from earlier studies at Surrey where detection of EN2 in urine, after secretion from prostate cancer cells, was shown to be a robust diagnostic biomarker of prostate cancer.